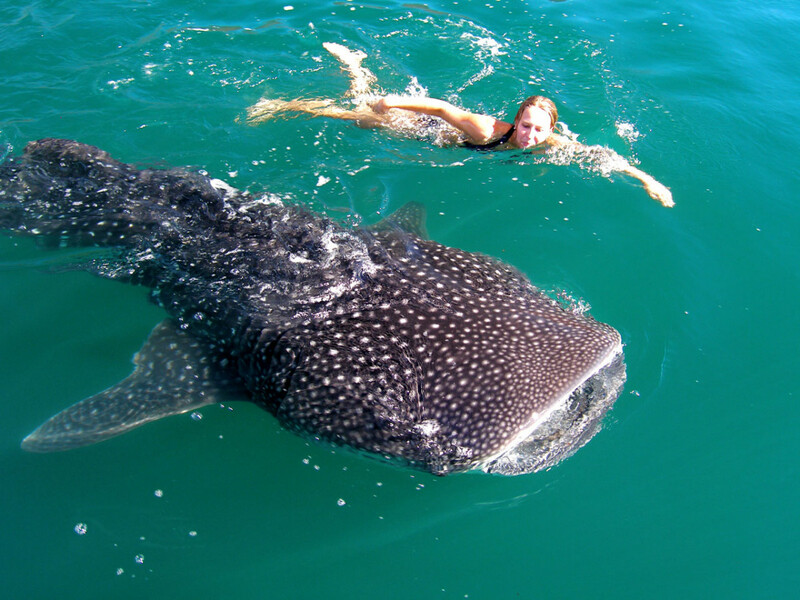 Every fall, whale sharks make their annual return to the warm, nutrient-rich waters of Mexico’s Bahia de los Angeles in Baja’s Sea of Cortez. Observing and snorkeling with these gentle 25 to 40-foot behemoths can be a life-changing experience. So, it’s no wonder that Austin Adventures’ chose such an encounter to be the next major “Wow” in their ever-expanding line-up of extraordinary adventures. Sharing the wonders of this active six-day vacation departing Oct. 28, 2019, will be Dan Austin, founder and president of Montana-based Austin Adventures, and his partner in business and life, Carol Austin. Like clockwork each year from August into late fall, Whale Sharks migrate to the nutrient-rich waters of Baja’s Bahia de los Angeles. Not a whale and only technically a shark, this is the world’s largest fish. These gentle giants can grow up to 60 feet long on a diet of algae, plankton, and krill. There are only a handful of places on the planet where they make predictable appearances and luckily for North Americans, one of the best is just over two hours south by air from San Diego, CA. Novelist John Steinbeck once the dubbed the Sea of Cortez the “Galapagos of Mexico” thanks to a high concentration of whales and rare seabirds. The area is home to 900 varieties of fish and 2,000 species of marine invertebrates, making it the richest body of water on the planet. Las Animas Eco-Lodge is where guests will relax for five nights. The operator maintains a private fleet of modern aircraft to fly guests from San Diego, CA, to the sleepy fishing village of Bahia de los Angeles (population 900). After the two-hour flight, boats shuttle guests another hour south to the resort situated on a private mile-long crescent of white sand beach overlooking cavorting rays, sea lions and dolphins. Accommodations are well-appointed beachside yurts housing just a dozen visitors weekly. The yurts are appointed with in-room solar shower and composting toilet, twin and king-size beds with comforters and high thread-count linens, and covered patios with hammocks. A centrally located, open-sided palapa offers a spacious covered deck with tables, couches and chairs. Located here are the kitchen, central dining area, cantina bar, communal lounge and game area featuring a satellite system with fairly dependable Internet and phone connection. The all-inclusive rate for this special President’s Trip is $2,995 per person, double occupancy for a six-day/five-night escape. The price includes deluxe yurt accommodations, roundtrip charter flights from San Diego, naturalist guided outings, daily snorkeling with whale sharks (weather permitting), panga shuttles and transportation, healthy homemade meals, complimentary beverages (including beer and margaritas) and optional free activities such as kayaking, beach snorkeling, whale watching, swimming, fishing, sailing and hiking. For more information and trip availability, please call 1.800.575.1540 or email [email protected]. For a full roster of Austin Adventures’ 2019 trips, cruises and distinctive accommodations on seven continents please visit: http://www.austinadventures.com. To access the 2019 digital catalog or order a print copy, go to: https://www.austinadventures.com/request-catalog/. Austin Adventures is a Travel + Leisure Magazine World’s Best two-time award winner and a Virtuoso Preferred Tour Operator. Based in Billings, Montana, Austin Adventures has spent over 35 years building an international reputation as a top provider of luxury, small group, multisport tours for adults and families to the world’s most captivating destinations. They have been acknowledged twice by Travel + Leisure Magazine with the prestigious World’s Best Awards along with other national media accolades and distinctions. Austin Adventures has perfected the art of creating itineraries featuring exceptional regional dining, distinctive accommodations, incredible guides and exhilarating activities, all while keeping all-inclusive rates and services the norm. In addition to scheduled group departures on all seven continents, Austin Adventures has developed a reputation as the leader in customized trip planning and execution, all backed by the industry’s best money-back satisfaction guarantee.